NOT FAR FROMthe temple in Jerusalem was a pool called Bethesda. At certain times the water in this pool was made to bubble on the surface. 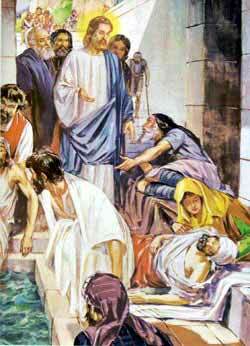 Many sick people, and cripples, and blind folk came to the pool and waited long for the water to move. And five porches were built beside the pool, where these afflicted people might rest in the shade and wait for a chance to be cured of their affliction by bathing in the troubled waters. One Sabbath-day while Jesus was in Jerusalem he walked through the porches beside the pool. And there he saw the afflicted people who had come for healing. How many there were we do not know, but lying on a mat near the edge of a porch was one man who had not walked for nearly forty years. What a pitiful sight he was! Jesus knew how long the poor man had been crippled although no one told him. Perhaps the cripple thought this a strange question. He answered “Sir, I have no one to help me when the water moves, and before I can crawl down some one else steps in. “Who is this stranger?” they demanded, for they were angry to think that any one should break one of the laws they kept on the Sabbath. But the poor man did not know who Jesus was, so he could not tell. This entry was posted in Discipleship and tagged Christ Jesus, David, God, Gospel of Matthew, Jerusalem, Jesu, Jesus Christ, John, Levite, Luke, Pharisee, Sabbath, Son of man, theology. Bookmark the permalink.